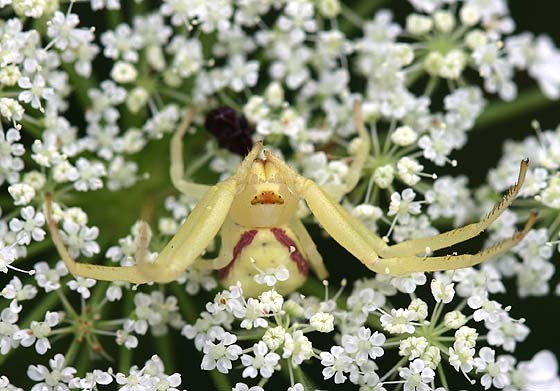 I think this is a Goldenrod Crab spider...can anyone verify? This was shot in a field near our house, on a head of Queen Anne's Lace. It was late in the afternoon and the body almost seemed to glow against the white of the flowers. Tony, this looks almost exactly like the spider I imaged. It's definitely not confined to Goldenrod so I don't know why that's the common name. This an excellent natural shot. So it is a Goldenrod Crab...Wow, what a broad color variation...is the color dependent on the plant they are hunting on? I usually see the yellow ones on yellow flowers.